The Egyptian Mau is a fascinating cat, not only because of its past history, but because of its delightful personality and striking appearance.The name of the breed Mau derived from the Egyptian word for cat. Regarded by most registries as the only natural spotted breed of domestic cat, experts consider that mixed breeding with a sub species of wild cat was probably responsible for the unique coat pattern. 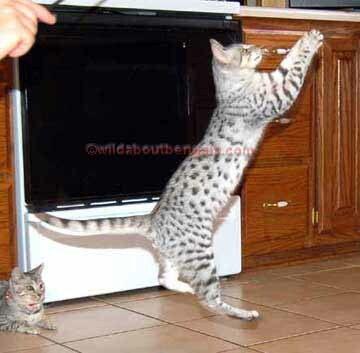 Spotted cats were often depicted in ancient Egyptian wall paintings dating back over 3,000 years and many believe these to be the true ancestors of the Egyptian Mau. The ancient Egyptians held these cats in great affection and respect. They were worshipped as deities, cherished as pets, protected by laws, and mummified and mourned upon their death. Today's pedigree Mau stems from North America where it originated from cats imported by the exiled Russian princess, Nathalie Troubetskoy in 1956. In the past, all Egyptian Maus in the U.S. and Canada traced their ancestry to two of the original imports from her Fatima Cattery, but recent importations have enriched and broadened the available gene pool for breeders. Recognition for championship competition came in 1977. 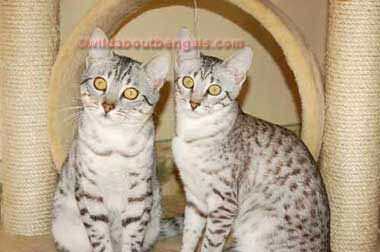 The Egyptian Mau is an active, colorful cat of medium size with well-developed muscles. It is a graceful mover described as having a "cheetah-like stride". The head is typically foreign, wedge shaped with rounded features, rather large ears, a moderately long nose and distinctive mascara lines. The elegant body is randomly spotted with banded legs and tail. Large, expressive almond eyes set under patterned frown marks create that "what-me-worry" expression which adds to the appeal of this pretty face. Males tend to be larger than females and also have fuller cheeks and are more muscular on the shoulders and around the neck. Despite the Mau's eleganct, slim body, slender legs and dainty feet, this is a feline of tremendous strength. These athletic cats are considered the fastest breed of domestic cat. Maus have been clocked running over 30 mph. 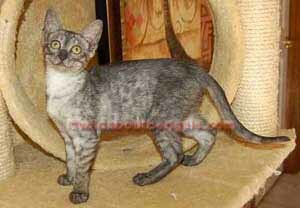 The coat length of the Egyptian Mau is technically described as "medium short". The fine texture enhances the characteristic lustrous sheen for which the Mau's coat is famous. Maus are very easy to groom requiring only minimum attention. 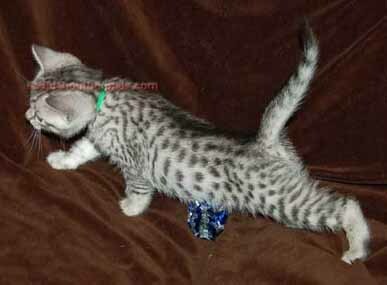 The Egyptian Mau is a cat that likes company. Extremely intelligent cats, Egyptian Maus place a great importance on their human family and are noted for their fiercely loyal and passionate devotion to their owners. They are active cats that like to exercise, and many are quite amenable to training to a harness and lead. A Mau will also communicate by chortling in a soft melodious voice and with a characteristic wiggle of the tail while "kneading" with its soft paws and licking your face. 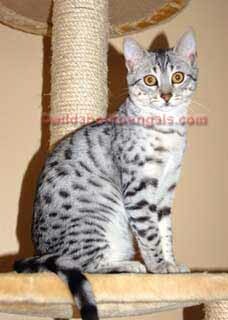 Egyptian Mau owners know they have a very special cat in their alert, even-tempered Maus. 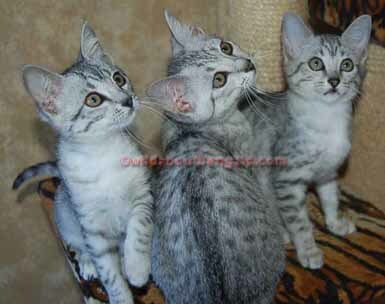 The Egyptian Mau is always spotted and comes in three colors: bronze, silver and smoke. Bronze color has dark brown to seal spots on a dark to lighter bronze background. Silver color has black spots on a pure silver white background, with smoke color having black spots on a smoke background. Coat color can take up to 15 months to fully develop. 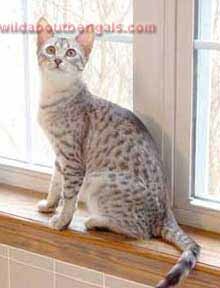 The spots on an Egyptian Mau are random in their distribution over the body and vary in size as well as shape. They can be round, oval or irregular or a mixture of all three. Ideally the contrast between dark spots and ground color should be distinct. Broken necklaces on the chest, buttons on the stomach and that all-important "M" on the forehead complete the pattern. Eyes are an expressive, almond-shaped beautiful gooseberry green and can take over a year to reach their full color.